E. caribaea of Michigan Flora. Wet sandy, marly borders of ponds in northwestern Washtenaw Co. and northeastern Jackson Co. This is a widespread tropical species, occurring in the southern United States and disjunct in the southern Great Lakes region. Not seen in Michigan since 1937. 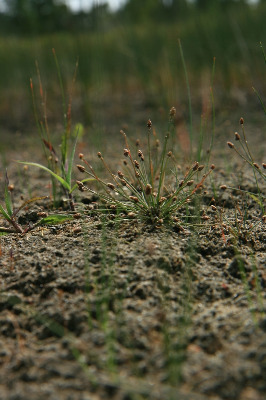 The disjunct Great Lakes area plants were long ago described as a distinct species, Eleocharis dispar E. J. Hill, with purple-tinted scales, whereas tropical plants all have basically straw colored or greenish scales. If recognized at all, this is now considered only a variety. MICHIGAN FLORA ONLINE. A. A. Reznicek, E. G. Voss, & B. S. Walters. February 2011. University of Michigan. Web. 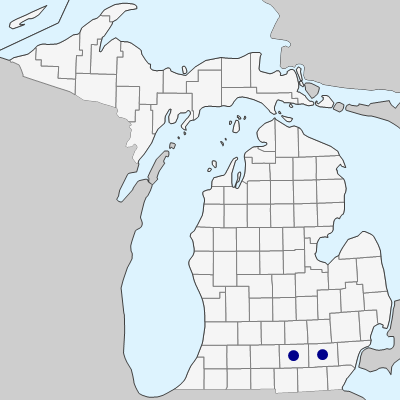 April 21, 2019. https://michiganflora.net/species.aspx?id=1108.